There is something about the Chevrolet Chevette that makes it a classic favorite among those authors who feel compelled to write “worst car ever” lists more than a quarter of a century after it left production, but the fact remains that more than a million of the subcompacts sold in the United States and millions more sold around the globe. Forty years after its introduction in the United States, it’s worth taking a look at how the Chevette made it to market and how it kept Chevrolet going through some difficult times. As with many product decisions made in the Seventies—and with pretty much any product decision resulting in a subcompact car—the U.S. Chevette’s origins arise from a fuel crisis, specifically the 1973 Oil Embargo. Chevrolet had plenty of big, fuel-inefficient cars on hand that just got bigger that season, but only one economy car—the Vega—and that one was taking a beating with claims of junk engines. So, according to Richard Langworth and Jan Norbye’s Complete History of General Motors, 1908-1986, Chevrolet turned to none other than Ed Cole, president of GM and former Chevrolet general manager. Cole, the driving force behind both the Corvair and the Vega, had tried for years to introduce Chevrolet buyers to smaller cars; here he’d get one more chance. The answer, Cole determined, came not in designing yet another small car from the ground up, as the company did with the Corvair and Vega. Instead, it came from Brazil, where GM had perhaps not so coincidentally introduced its German-developed world car in March of 1973. Sold in Brazil as the Chevrolet Chevette, the subcompact two-door sedan rode a 94-inch wheelbase, used an Isuzu-derived four-cylinder engine, and drove through its rear wheels. As a world car, the T-car quickly spread to GM’s other interests around the globe. That September it became the Opel Kadett C in Germany; by 1975, it became the Opel K-180 in Argentina, the Isuzu Bellett Gemini in Japan, the Vauxhall Chevette in England, and the Holden Gemini in Australia. While the same platform underpinned the cars in each market, usually powered by some variation of the Isuzu four-cylinder engine, sheetmetal differed from country to country, allowing a number of various bodystyles from coupe to hatchback to station wagon to pickup to delivery van. In all, according to T-car enthusiasts, the Chevette assumed almost 40 different names around the world and perhaps hundreds of variations. 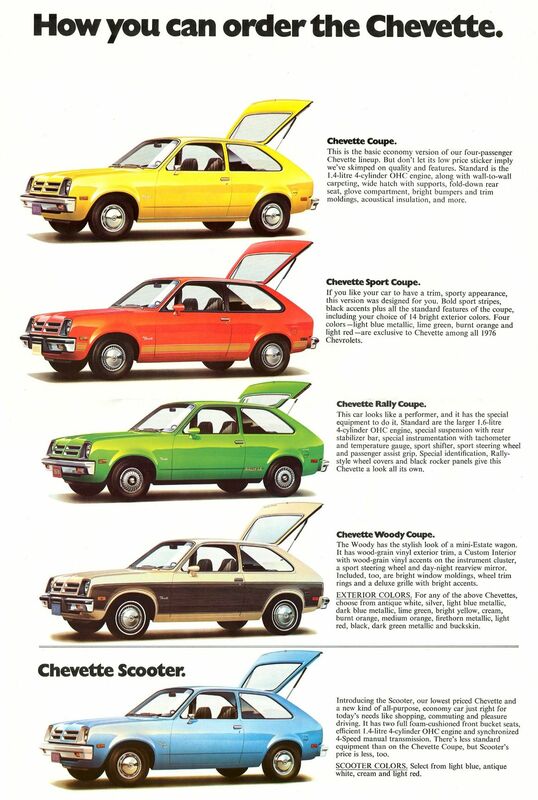 1976 Chevette lineup. Image courtesy Old Car Manual Project. Official introduction to the U.S. market came in September 1975 with just one bodystyle—three-door hatchback—and five total trim lines spread over two models. Taking a page from AMC’s introduction of the Gremlin a few years prior, Chevrolet offered the Scooter without a backseat to create an ultra-cheapo model that sold for less than $2,900 and within a Hamilton of the Gremlin’s selling price. Engine selection consisted of the 52 hp 1.4L and the 60 hp 1.6L, both overhead-camshaft four-cylinders used extensively throughout the T-car global family. Chevrolet marketed it as a thrifty car without apparently ever using the word “thrift.” Mileage (40 MPG highway, 28 city) figured heavily into promotional materials, as did the included booklet that guided owners through servicing the car themselves with the aid of an on-board diagnostic port (Chevrolet apparently figured customers would be too frugal to pay a shop or dealership to service their cars for them). Chevrolet also made plenty of hay about the fact that the Chevette was the first metric car from the brand, apparently in an attempt to capitalize on the then-pending Metric Conversion Act of 1975 and not on, say, demand from the American consumer. While the Chevette didn’t debut to great numbers—187,000 in the 1976 model year, 133,000 in 1977, or less than the Vega and Monza combined in both years—the addition of a U.S. market-specific four-door hatchback version with three more inches of wheelbase in 1978 helped boost total sales to almost 300,000. Sales remained strong throughout the early 1980s, during which time Chevrolet added a diesel version and Pontiac added a rebadged version called the T1000. More importantly, the Chevette bought Chevrolet some time to downsize the behemoth cars that populated the company’s lineup—the first of those redesigns wouldn’t come about until 1977—and to begin the process of redesigning its cars for front-wheel drive and to introduce other fuel-saving technologies. 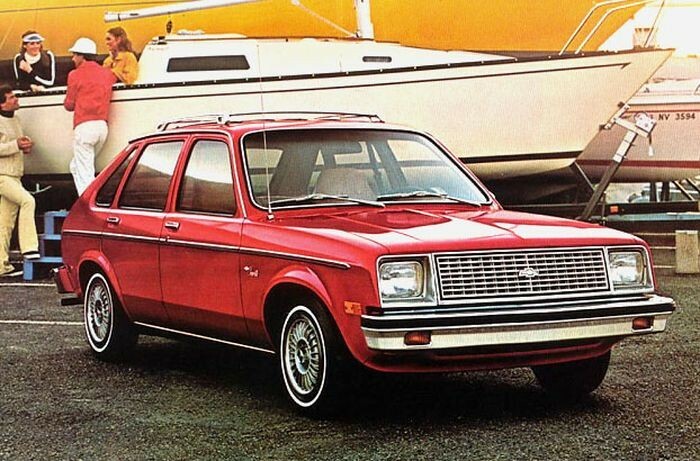 It also helped the company weather the second fuel crisis of 1979; without a Chevette in the lineup, Chevrolet would have taken it on the chin for not having an economy car on offer, but instead, Chevrolet sold more than 400,000 Chevettes in both 1980 and 1981. By the mid-1980s, though, with increased competition from Japanese imports in the subcompact market, Chevette sales dwindled. By this time, Chevrolet’s portfolio of front-wheel-drive compacts and subcompacts made updating the Chevette a moot point. The company squeezed a couple more years out of the Chevette until sales dropped off to less than 54,000 in 1987 and then canceled the car. Post-facelift 1979 Chevette. Image courtesy Old Car Manual Project. Overseas, the T-car marched on for a few more years. The Argentine Opel K-180 became the GMC Chevette and lasted until 1994, as did the Chevy 500 pickup version in Brazil; a taxi version reportedly remained on the Colombian market until 1998. While no GM cars marketed in the United States other than the T1000 shared the T-car platform or any of the engines developed for it, the Pontiac Fiero did borrow the Chevette’s front suspension, the acclaimed Isuzu Impulse managed to make the T-car platform look Eighties modern, and one carmaker, Leata Motors in Post Falls, Idaho, did use the Chevette as the basis for the company’s Cabalero sedan and pickup. These days, only Chevettes in mint condition or those modified with bigger engines get any sort of attention from American car collectors; they rarely, if ever, show up at auctions, and guaranteed you’ll never see one on a concours show field. Yet the Chevette represents one of Ed Cole’s last achievements while at GM, it provided a lifeline to Chevrolet during a time of shaky confidence in the brand, and it put basic and affordable transportation in the hands of millions of Americans. That ought to count for something more than the jokes made at the Chevette’s expense in the years since. There are currently no comments on Chevrolet Chevette (1976-1987). Perhaps you would like to add one of your own?